Home » Projects » Visual Merchandising » Denim Done Differently! Denim is like the ‘armour’ in the 21st century, a timeless style that everyone goes for. We recently saw denim taking centre-stage in many stores, where each campaign spoke a different language. We take a closer look at how Shoppers Stop, Central, Pepe Jeans and Lifestyle have used denim theme on their window displays creatively. Akash Kumar, Deputy General Manager - VM, Lifestyle International; Pawan Nagarwal, Chief – Visual Merchandising & Experience Design, Central; Arden D’Souza, Head - Visual Merchandising at Shoppers Stop and Tejaswini S Nigam, Head - Visual Merchandising at Pepe Jeans speak to VM&RD on how their brands have depicted Denim. Denim has always been the icon of youth. But Shoppers Stop took its denim campaign to a different level. The entire concept this time around was about Denim as the new Work Wear – hence the title ‘Denim To Work’. It was targeted towards changing the mindset of the customer to ensure that Denim becomes the new trend in office wear. The campaign ushered in the idea of denims from Monday – Friday. #Ripthedesignations was the Instagram handle tagged to the promo. It was supported by BTL & ATL advertisements buzzing in major cities and online. All designations were cast aside to make for the new CEO – Chief Everything Officer. According to the VM team, the idea was denim should replace the regular work wear. In sync with fun and casual work culture and environment, the entire look of the visual merchandising campaign was about a free office space, uncluttered modern, with a twist of denim. The employee has a choice of denim to work daily: Monday - Blacks, Tuesday - Raw, Wednesday - Blues, Thursday - Lights and Friday – Cuts. This was the clear display thematic – a completely different in approach to denim display. It has yielded a positive result with customers and brands alike. Going beyond western wear, Shoppers Stop has showcased Denim even in the ethnic wear category. Various vendors have worked on the project across the country, while most of the execution has been by the Shoppers Stop VM team. Pepe took the customisation route to position denim in a different light. The iconic denim brand unveiled - Design your own denim with Pepe Jeans London’s customisation service, ‘the Custom Studio’. Part of the label’s concept store initiative, this pioneering experience enables you to step into the design seat and customise your denim as you see fit in four easy steps at selected few stores. First, pick a laser print from the catalogue to be featured on the denim. Next choose the fastenings – be it buttons, rivets or tacks. Then select the brush of the garment and where exactly you want it. Lastly, choose the colours you want your print to be in. A Denim Expert will always be available to advise as well. 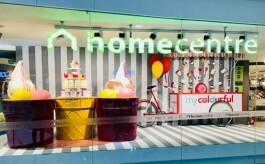 Thematic props and communication have been displayed in the window display, talking all about customisation. The vendors are Hammer in Mumbai and Water Design Studio in Delhi. 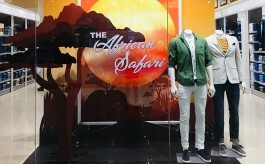 The objective of the window display of Central was to celebrate the birth of denim. The first pair of jeans was made on the 20th of May 1873. So, Central had a week-long celebration of from May 20-28. It was all about the celebration of jeans. From vibrant splashes of paint to embroidery, Central has represented the essence of denim and versatility in different ways and displays within the store. Celebrating the iconic fabric and garment, Central went for a blue theme and created a prop which says, ‘Happy Birthday Blue Jeans’ with eye-catchy imagery to it. The retailer has also highlighted various washes and the key brands on the mannequins. Hyderabad with Veerasham. The core VM team explained that a lot of the creative work was executed by the store VM managers too. Each year is a fresh chapter and denim as a product continues to surprise and excite customers with the product innovations that brands bring about. This year, in association with Pepe, Lifestyle has captured the fun aspect of Denim. The feel of the space is created with unfinished textured paint finish. Denim also appeals to the unconventional and hence pipes were used to create a sense of dynamism. For a month, Denim was highlighted across all touchpoints and brands also jumped in with offers to add the icing on the cake. The displays were planned around the theme - Denim destination. It reiterates the strong recall as a destination for curated collection of fashionable denim wear. Jeet Enterprises is the vendor for North; for West its Pyramid Retail Services and for the South its Supra Digital.